The Sound Devices PIX 270i Complete Kit with XM-CADDY Pack is a file-based video recorder featuring 3G-SDI and HDMI video inputs and outputs. It records edit-ready Apple ProRes or Avid DNxHD files and allows sequential or simultaneous recording to four 2.5" Sound Devices-approved SSDs. For added convenience, this kit features the XM-CADDY Pack, which includes two PIX-SSD6 240GB SSDs, each with a 2.5" Dive Caddy and mounting hardware for PIX recorders. The SSDs are from Other World Computing and come pre-formatted by Sound Devices. Extensive network connectivity and multi-unit synchronization supports grouping multiple PIX recorders over Ethernet for simultaneous frame-accurate multicam recording and playback. The PIX 270i can group with other PIX 270i recorders, as well as PIX 260i, with all of the recorders functioning as a single system. The grouped recorders can be controlled two ways: directly through the PIX hardware interface or via a browser accessing the embedded built-in web-based control panel. The PIX 270i records Quicktime files in a variety of data rates, from Apple ProRes 4444 at 330 Mbps down to 36 Mbps proxy files. A built-in scaler will let you perform up, down, and cross conversion, pulldown removal, and aspect ratio conversions between HD and SD. It supports eight channels of embedded audio over its HDMI input/output and 16 channels of embedded audio over its SDI input/output. For independent audio, two channels of analog audio in/out via balanced line-level XLR inputs and eight channels of AES/EBU digital audio is also available. For large-scale audio systems, the PIX 270i supports 64 channels of MADI audio and 64 channels of Dante audio I/O. For monitoring your footage, the PIX 270i features a 5" IPS display with 800x480 resolution. A built-in web server lets you control and setup the PIX 270i using any browser-capable device. You can also add external control devices using the RS-422 port or USB port. The PIX 270i is housed in a 1/2-rack 2U chassis and is powered by 10-27 VDC via a 4-pin XLR connector. A universal 66W power supply with detachable IEC power cord is included. Please see the links below for more information on the items in this kit. The Sound Devices PIX 270i Video Recorder & Network Connected Video Deck is a file-based video recorder featuring 3G-SDI and HDMI video inputs and outputs. It records edit-ready Apple ProRes or Avid DNxHD files and allows sequential or simultaneous recording to up to four Sound Devices-approved SSDs. A built-in scaler will let you perform up, down, and cross conversion, pulldown removal, and aspect ratio conversions between HD and SD. The PIX 270i records Quicktime files in a variety of data rates, from Apple ProRes 4444 at 330 Mbps down to 36 Mbps proxy files. It supports eight channels of embedded audio over its HDMI input/output and 16 channels of embedded audio over its SDI input/output. For independent audio, two channels of analog audio in/out via balanced line-level XLR inputs and eight channels of AES/EBU digital audio is also available. For large-scale audio systems, the PIX 270i supports 64 channels of MADI audio and 64 channels of Dante audio I/O. For monitoring your footage, the PIX 270i features a 5" IPS display with 800x480 resolution. A built-in web server lets you control and setup the PIX 270i using any browser-capable device. You can also add external control devices using the RS-422 port or USB port. The PIX 270i is housed in a 1/2-rack 2U chassis and is powered by 10-27 VDC via a 4-pin XLR connector. The PIX 270i records Quicktime files in edit-ready Apple ProRes or Avid DNxHD video formats. You can record in a variety of formats, from Apple ProRes 4444 (330 Mbps) down to 36 Mbps proxy files. For color-critical applications, recording to ProRes 4444 provides uncompressed alpha-channel transparency for superb chroma keying and color grading performance. The SDI input accepts 12-bit 3G-SDI (4:4:4 RGB or YCbCr), HD-SDI, and SD-SDI. The HDMI input accepts HD and SD video. Recording to ProRes 4444 via 3G-SDI 4:4:4 input provides recordings that are perceptually indistinguishable from the original source material. Extensive network connectivity and multi-unit synchronization support grouping multiple PIX recorders over Ethernet for simultaneous frame-accurate multicam recording and playback. The PIX 270i can group with other PIX 270i recorders, as well as PIX 260i, and PIX 250i units, with all of the recorders functioning as a single system. The grouped recorders can be controlled two ways: directly through the PIX hardware interface or via a browser accessing the embedded built-in web-based control panel. The PIX 270i records and plays back Quicktime video to removable 2.5" solid-state drives (SSDs). Drives require Sound Devices' PIX-CADDY 2 in order to be used. Drives and PIX-CADDY 2 are sold separately. You can set up the drives for sequential recording or for simultaneous recording for immediate file redundancy and backup. Control the PIX 270i from any browser-capable computer or mobile device via its Gigabit Ethernet port. When connected to a data network, transport controls and setup menu controls are available on PIXNET. PIXNET offers control of one or multiple PIX 270i recorders. Multiple units can be grouped for simultaneous control. Frame synchronized transport control between multiple grouped PIX 270i's lets you control Record, Play, Stop, Pause, Jog (frame by frame), Shuttle, Fast Forward, and Rewind for all grouped PIX 270i recorders. Record, play, stop, fast-forward, rewind, shuttle, jog, and locate control are all available over RS-422 for remote control operation. Remote control is further enhanced by GPIO ports and standard USB keyboards. USB keyboards also offer menu navigation and text entry. The PIX 270i offers a wide range of playback features. Playback control includes off-speed, forward, reverse, jog, shuttle, freeze-frame, looping, and custom playlists. File markers can be set either while recording or playing back with the press of a button. Loop playback offers continuously looped playback of whole files or between file markers. Playlists help organize multiple files for consecutive or loop playback. With a 5" IPS LCD monitor, the PIX 270i can be used to accurately evaluate your video signals during recording and playback. Picture overlays include audio metering, timecode, file type, record status, and frame rate information. The display also doubles as a fast, simple menu interface. Timecode and record status display can be over-layed on the SDI and HDMI outputs. Edit a scene, take, notes, track names, and circle metadata for the next take, current take, and previous takes even while recording. All edits ripple across all drives being recorded to. Drives connected to a PIX 270i are accessible on Ethernet-based networks as read and write SMB shares, for easy file sharing. Files can be copied to or from any PIX 270i located on a network, from access across a room, or across the globe. Drives can be automatically switched to Ethernet when they are full. The internal, high-accuracy Ambient timecode generator makes the PIX 270i at home on complex, multi-camera and sync-sound productions. All common timecode frame rates and modes are supported. Embedded timecode over SDI and HDMI is also supported. The PIX 270i features a hardware scaler and frame rate converter. Up/down/cross-conversion and pulldown removal give you the ability to record files in a user-requested rate, even rates not supported by the camera. The PIX 270i also supports aspect ratio conversion. The PIX 270i is equipped with Sound Devices' PowerSafe technology. PowerSafe circuitry has a built-in 10-second power reserve. In the event of power loss, the unit continues to operate for up to 10 seconds, and then stops any file operation and shuts down. This ensures that a complete power loss has no effect on the recording. PowerSafe also provides two-second "power-on-to-recording" so the recorder is ready for operation at moment's notice. The PIX 270i draws 10-27 VDC through a four-pin XLR connector. A secondary connection allows connection to redundant power supplies. 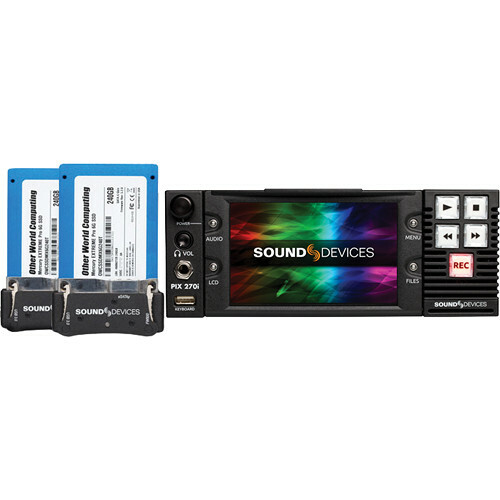 The Sound Devices XM-Caddy Pack - 2 SSDs with Caddies for PIX 220i/240i/250i/260i/270i & 970 recorders includes two 240GB SATA SSDs, and two PIX-CADDY 2 caddies, and mounting accessories. The SSDs are from Other World Computing, and are pre-formatted by Sound Devices. The included PIX-CADDY 2 units transport the SSDs, and provide Firewire 800 (400 compatible), USB 3.0 (USB 2, and 1.1 compatible), and eSATAp connectivity to a bare SSD. Once you install an SSD into the caddy, you can easily insert and remove the SSDs from an available computer. The caddy allows you to connect the included SSDs to a computer, and the SSD shows up as an UDF volume for access to the files. Approved mechanical drives are recommended for use only in stationary applications. Excessive vibration or motion may cause data corruption. Box Dimensions (LxWxH) 16.2 x 11.0 x 5.5"
Box Dimensions (LxWxH) 10.787 x 5.354 x 2.441"